Part – I: Common to Hindustani / Karnatik / RabindraSangeet / Percussion Instrument. 1. Who has categorized the classification of Raga as ‘Mitra, Soochak and Dooti’ under RaagVargikaran? 2. The Shwetambar Jain Music author of Indian music, who had received the honour of ‘Vachanacharya’? 3. Who has explained the section of Ragas as ‘Deshya, Shuddha Salag and Chhaila’? 4. In which treatise, there are four kinds of ‘Audav-Shadav-Purna-Apurna’? 5. Which author has classified alankaras under title of seven alankaras for musicians especially? 6. Who is the founder of ‘Nayak- Nayika-Bhed’ in musial treatises? 7. Who has classified the Ragas as ‘Uttam-Madhyam-Adham’? 10. How many ‘Alankaar’ are described in ‘Sangeet-Ratnaakar’? 16. Which ‘Tala’ has same no. of matra as ‘Trital’ has? 17. 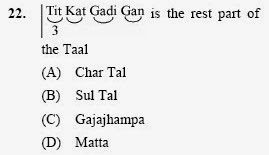 ‘Naba Tal’ has the divisional structure of which one of the following? 18. How many ‘Talas are used to compose the total songs of the ‘Geetanjali’? 19. Which ‘Gharana’ influenced Rabindranath the most to compose Raga based songs? 20. Which one is the folk song category of Bengal under the following? 21. Which Tabla player is known as the Khalifa of Lucknow Gharana? 23. The Theka of Deepchandi Tal is used in which vocal system? 25. Which Tabla Player is also known as? 27. Who was the first Guitar player in the field of Hindustani Music? 28. Who was the famous artist of ‘Agra Gharana’? 29. Who was the first Vice-Chancellor of Indira Kala Sangeet Vishwavidyalaya? 30. Which of the following musicologists is not from Indian origin? 31. On which date, Pt. Ravishankar had passed away? 33. ‘Small (Choti) Chikari’ string of Sitar is tuned in which ‘Swara’? 36. What is festival music of Mahabharat age? 37. Which is the SaptaSwaras of Sam Vidhan’s Brahman Grantha? 38. Which is collection of Geya Richas of Rigveda? 39. Which are the initial swaras of Samaveda? 40. Which are the main three ‘Uchcharana Sthana’? 41. Sama is related to which Shiksha? 42. Krishna is the inventor of which art? 43. Who is the founder of ‘Indian Musicological Society’? 44. Who is the editor of some parts of Nanyadeva’s ‘Bharatbhashyam’? 45. Which Grantha is also named as ‘Saraswati Hridayalankar’? 46. What is the name of ‘Abhilashitarth Chintamani Treatise’? 47. How many categories of Rag Vargikaran are there in Sangeet Makrand written by Narad? 48. Which treatise is known as dattil – Narad – Samvad? 49. What is the name of the Book written by Prof. Ramkrishna Kavi? 50. In which film, Pt. Rajan Mishra - Pt. Sajan Mishra have Sung the classical based songs? Assertion (A): Anubandha was deleted from TanaVarnas as they lacked musical excellence. (A) Speed of singing is constant and speed of Tala increases. Assertion (A): In Ragam Tanam Pallavi, the Prathamanga and D⋅vitiyanga is separated by a stressed syllable called padagarbham. 26. In which book, all writings of Tagore is compiled? 28. ‘Bhenge Mor Gharer Chabi’ song is based on which category? 29. ‘Bajao-re Mohan Banshi’ song is from which Kavya Geeti of Tagore? 30. ‘Hriday Amar Nache-re Ajike’ song is included in which ‘Kabya Granth’? 31. Which of the following pairs is correctly matched? 32. Which of the following pairs is not correctly matched? 33. Which bowing instrument is not used for accompaniment with Rabindra Sangeet? 35. ‘Saurasen Alias Aruneswar’ is a character in which dance-drama written by Rabindranath? 36. Which song based dance-drama has the character of King Dasharath written by Tagore? 37. Who was awarded ‘Doctor of Music’ from Oxford University among the following? 38. Who was the editor of ‘Tatvabodhini’ magazine? 39. Which of the following pairs is correctly matched? 40. Who was the author of the book ‘Yantra Kshetra Deepika’? 41. “Pushpa Vane Pushpa Nahi” song is based on which category? 42. ‘Aaji E Ananda Sandhya’ song is based on which raga? 45. The following Tagore songs are based on which category? 46. The following songs are under which category? 47. Which one among the following written by Tagore for children? 48. Which one is the original Hindustani Song of ‘Antare Jagicho’? 49. Which song was composed by Tagore for the inauguration of ‘Sree Niketan’? 50. ‘Pratidin Ami, He Jiban Swami’ song is based on which ‘Raga’? 26. In Brahmtal on which matra second khali is placed? 27. Where has been organizing Hariballabha Sangeet Samaroh? 29. How many Talas are described in Sangeet Ratnakar? 30. In which year Padmabhushan has been given to Ustad Zakir Hussain? 33. In which Tala Quada is not necessary to play? 35. What will be the Layakari of Quadain Ektal after converting the lay in Teen Tal? 36. From where it will begin Chaugun of Pancham Sawari in one aawartan ? 37. Which king was regular Nakkara player in Naubat Khana? 38. What was the ancient name of instrument Hudka? 39. Damama is the folk instrument of which state? 40. Which book is not written by Prof. Girish Chandra Srivastava? 41. Prominent Tabla player in film music? 42. What is the name of the Guru of Pt. Suresh Talwalkar? 44. Where has been organized Chakradhar Sangeet Samaroh? 47. How many Matras in Pashto Tal? 48. Which word is best for Tabla? 49. Dhaunsa is a folk instrument. This is a kind of _________. 50. Author of “Bharatiya Sangeet Vadya”?